Continuing with my 2010 theme of science immersion, I attended with anticipation last week an excellent and very timely lecture at Caltech’s venerably Beckman Auditorium. 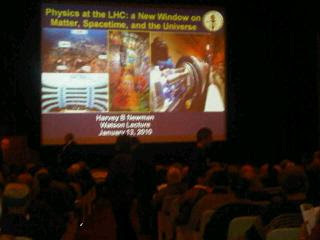 Part of the on-going Earnest C. Watson Lecture Series, the lecture was named “Physics at the Large Hadron Collider – A New Window on Matter, Space-time, and the Universe” and featured speaker Harvey B. Newman, Professor of Physics at Caltech. Dr. Newman and his high energy physics group at Caltech have played central roles at CERN’s LHC, so the lecture was a great opportunity for an insider’s view of LHC. I arrived to campus a couple of hours before the 8pm start time for the lecture, armed with my copy of “The Quantum Frontier” which is an excellent general audience book on the LHC. I headed over to Pie N Burger for a leisurely dinner while getting up to speed with the various LHC experiments. After dinner I strolled over to Beckman only to find a long line of particle physics enthusiasts winding out from the building. Much to my surprise, LHC is quite a popular topic with the Caltech community, so I felt right at home amongst my science brethren. I got in line and eventually entered the enormous Beckman auditorium. As 8pm approached, I couldn’t believe the crowd as the venue was standing room only with people of all ages. Excitement was definitely in the air. Dr. Newman commenced the talk by leading us through a brief history of particle accelerators, LHC’s brief history and historic failure in 2008, and reemergence late last year to start doing science that could change the world’s understanding of matter. Newman spent much time going over the Compact Muon Solenoid (CMS) experiment with which researchers hope to find evidence of the Higgs Boson thought to be responsible for mass in the universe. Newman’s coverage of LHC was excellent as he presented a panorama of LHC science, and the road to discoveries that may emerge as early as in the coming months. I would highly recommend the Watson Lecture Series for anyone wishing to keep abreast of contemporary scientific efforts. The lectures are also very kid friendly, a great idea for a family outing.